Another week; another indie studio set up by triple-A vets. This time around it's Ganymede Games, which - as reported by Variety - has been established by Wargaming vets Jerry Prochazka and Lynn Stetson, who were in charge of third-party publishing and global user and product experiences at the World of Tanks giant respectively. 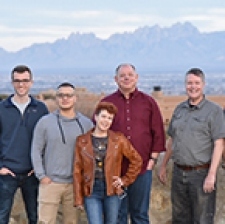 This new venture is being set up in Las Cruces, New Mexico, with the region's Refundable Film Product Tax Credit scheme being sizable in the decision to make this part of their world its home. He continued: “The other unique opportunity we have is that Mexican nationals so close allows us to expand our talent funnel, and that’s proven to be good, too. There are a lot of good networks in El Paso and Juarez. We visited NMSU (New Mexico State University), New Mexico Tech, the Dona Ana Community College, and we expect to recruit out of these New Mexico colleges.